If you haven’t given your title and description meta tags some love lately, it might be a good thing you procrastinated… there are new title and description lengths in the Google Search Results. Google has increased the width of the search results for nearly all users (although they could roll it back at any time). For reference, the space used for the organic search results is now 600 pixels wide, compared to the old 500 pixels. Depending on the length of the words, that is an additional 2-4 words that can be added to the title tag. Or some sites that are happy with their title tag could add their site name to the end instead. Of course, as with any SEO changes, you will want to monitor CTR of old titles versus new ones, but don’t forget that there are many other outside factors that affect CTR, including that in some results, each organic result will be higher up on the page, and some that were below the fold may be above it. Here is an example coming in right at 70 characters. And another coming in at 71. Added: Mobile has also increased their title tag length and it is even longer than desktop titles. Descriptions have also increased by about 16-20 characters per line. The new description length per line is 100 characters. I would expect that Google would adjust their search results to allow for longer overall descriptions, instead of the current situation where the second line is only using just over half the line space when compared to the first line. We are also seeing descriptions that were 100 characters or less simply showing up with a single description line in the search results. If you have some “short but sweet” search results that are under 100 characters, you will want to pay attention to those, since they will reduce your result’s footprint in the search results. For those with three line snippets, they are currently 278 characters per line. 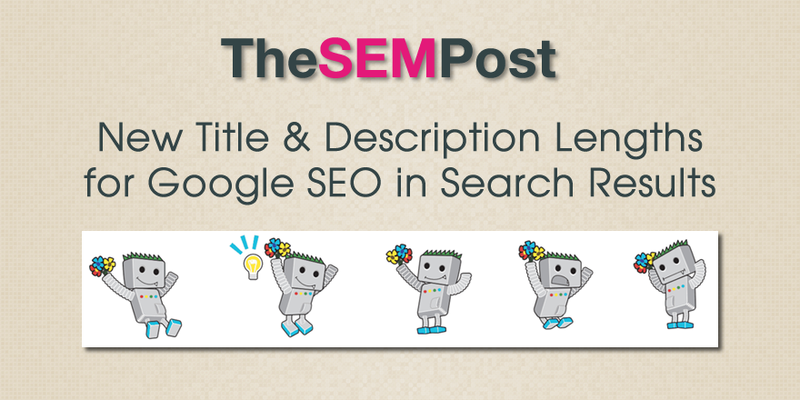 These new changes will definitely make it nicer for SEOs were were struggling within the title constraints and could use those extra 10-15 characters for their titles. But do keep in mind, Google could roll back the changes to the search results width, and these character counts could vary for non-English character languages. I am probably not alone when I say that I never saw this one coming! Interesting – is the title length now measure in characters , not pixels? Interesting to note that this will mean more scrolling on mobile – wondering if it will skew mobile CTR towards the top results even more than previous. How does mobile SERP has changed? I wouldn’t rush go stretching titles and descriptions according to the new standard, especially if they look “tidy” on mobile results pages. Was going to ask this same question. I find it interesting that, with Google so focused on mobile, they have rolled this change out across mobile devices as well – I can’t see this being good for a mobile user’s experience. Unless perhaps the best practices for mobile copy remain the same, despite the extended character lengths on desktop? 5) BONUS – longer SERP titles that contain “Voice_Search” questions can now be displayed in totality. Or is this just my conspiracy? Hey is it Real news, i doesn’t see any official announcement for this news. Or do you have any official source share here. Google has yet to say anything publicly, although I am waiting to hear back from them. But they often don’t when they make changes to how the search results displayed. Increasing Pixel length may lead to scroll down more. I mean in my mobile it may take 3 lines to show title for every search result. Is it eyewash for SEO ? or really we will benefit from this ? Hey JENNIFER SLEGG ! I could see only few titles are having 70 chars but most of titles truncated with ellipses(…), do you know the reason??? Remember it is technically pixel length, so 70 characters is a guideline depending on what characters you use.